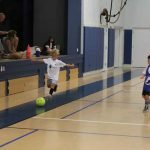 The Anna Maria Island Community Center’s fall recreational soccer season got kicked off with “Spirit,” Sept. 17-18 on the center’s two soccer fields. Players and parents participated in Spirit Week, a dress rehearsal for the upcoming season of competition. While the coaches were experimenting with lineups and evaluated players, parents had the opportunity to show who off team spirit. This spilled over to the kids, most of whom couldn’t pass up on a chance to spray neon green or orange paint in their hair. Most parents avoided spray-painting their hair, but they had no problem adorning themselves in team colors and making lots of noise to cheer on their kids and their team to victory. Island Dental Spa captured the 4-5 age division spirit award, while Dojo Athletics won in the 6-7 age division. Fran Maxon Real Estate had the most spirit in the 8-9 division, while Sparks Steel Art Tigers demonstrated the the most team spirit for the 10-11 division. The Gathering Place in the 12-13 division and Wash Family Construction in the 14-17 division also were Spirit Week winners in enthusiasm. This season there are 24 youth teams in six age divisions with games being played Monday through Friday after school and on Saturdays. The regular season runs until the end of November, when a tournament will be played. In addition to all of that soccer action, there’s a new adult soccer league, which will have games on Thursday evenings. It’s shaping up to be the best season of soccer in a long, long time. 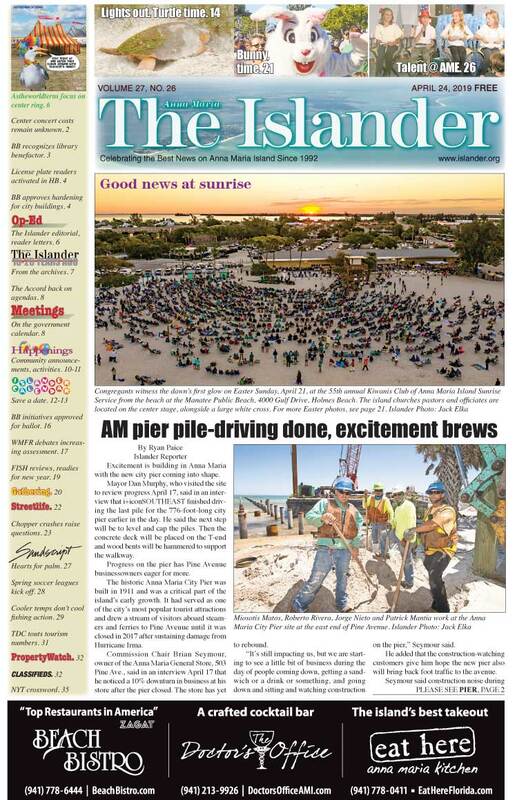 Check the schedules and team standings online weekly at HYPERLINK “http://www.islander.org” www.islander.org. And we’ll see you at the field. Two teams emerged from pool play with 3-0 records and were left to battle it out for the championship. In a back and forth tussle, Ron Pepka and Sam Samuels outlasted Jeff Moore and Steve Grossman by a 22-17 score. Sept. 15 horseshoe action saw two teams contend for bragging rights. John Johnson and Sam Samuels rolled past the team of Tim Sofran and Jerry Martinek 23-10 in the championship game. The Key Royale Club men’s 18-hole, two-best-balls match Sept. 15 saw the team of Pieter Thomassen, Vince Mercadante, Carl Voyles and Bob Jorgensen combine to torch the course with a 14-under-par 114 total. The women played a nine-hole, individual low-net game Sept. 14. Tootie Wagner took medalist honors in Flight A with a 4-over-par 36, one shot better than second-place finisher Penny Williamson. Flight B winner was Sally Martin, who carded a 5-under-par 27. Second place went to Chris Landkammer with a 2-under 30, while Joyce Reith was one shot back in third place. The men played a nine-hole, best-ball-of-foursome golf match Sept. 13. The team of Carl Voyles, Pieter Thomassen, Earl Huntzinger and Jim McCartney combined to card a 7-under-par 25 to earn the day’s bragging rights. The women and the men teamed up for their monthly mixed-scramble golf tournament Sept. 10. The team of Terry Westby, Adam Ksaizek and Al Guy took first place with a 16.7 score, while Jane Winegarden, Lou Winegarden Matt Behan and Bob Landgren took second place with a 21.9 average. Pieter Thomassen won closest to the pin on number three, while Terry Westby won on number eight.